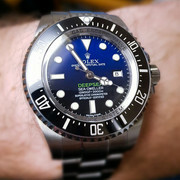 So the third purchase was on behalf of a friend of mine and he wanted the Noob Deepsea, so as always i emailed Tony direct got the price transfered the money etc etc, as alway Tony in communication throughout, had to chase him for a tracking number but he responded quickly with it, turned up today took 4 days to arrive in the UK from approving QC pictures. Anyway perfect transaction and he is very happy with his Deepsea. Last edited by CantReadTime; 09-08-18, 00:20. 4 days? That's... incredibly fast? Did you specifically request it be shipped via cheetah airlines or was it default?